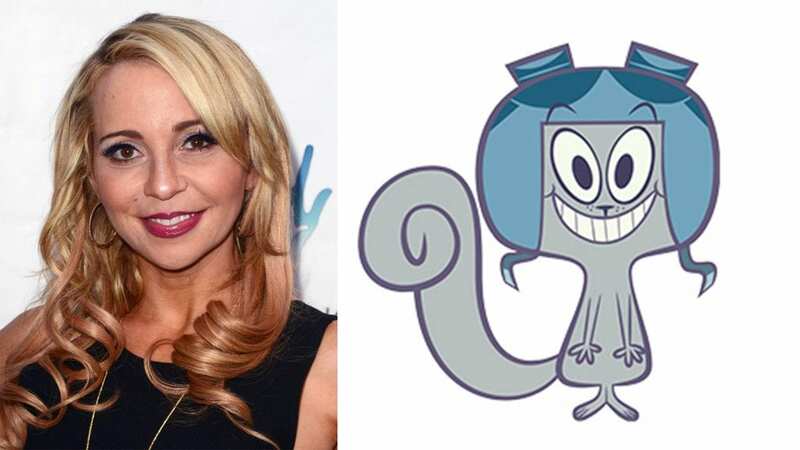 Today I had the opportunity of interviewing the incredible voice actress Tara Strong. She has enjoyed an unparalleled career voicing characters in everything from Twilight Sparkle in My Little Pony: Friendship is Magic to Raven in the Teen Titans shows. 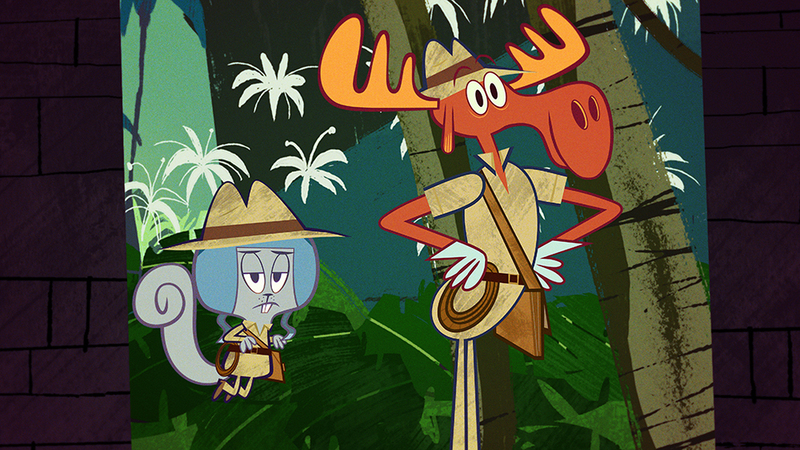 Recently the 2nd season of The Adventures of Rocky and Bullwinkle aired on Amazon prime where she got to voice the iconic role of Rocky the squirrel. Rotoscopers: How did you get started in your career as a voice actor? I knew when I was like 4 years old that I wanted to be a singer/dancer actress, but I didn’t know much about how to get into the business. I grew up in Toronto and nobody in my family was in the entertainment business, but I just kept bugging them to get me an agent, which they found out how to do when I was 13. I had my first bunch of auditions then. One of which included Hello Kitty, which was the first time she had a speaking role, and I was Hello Kitty at 13. I also got to do lots of on-camera theater. Throughout my career in Toronto I did quite a bit of animation. I had over 20 animated series before I moved to California. I didn’t know initially that it was going to be my primary, and I’m obviously grateful because it’s pretty fun. I’ll occasionally have roles on camera and do commercials here and there but animation is one of those worlds that once you are in it you have this amazing opportunity to play in this world for a really long time. Rotoscopers: You have done so many different roles. Do you have a process for coming up with a voice? When there’s an audition for a character they will send you a drawing and a brief character description. They may send you a vibe of the show so you get a sense of the world they are living in. And then they will give you what’s called sides which is a portion of the script and that’s what they’d like to hear auditioned. Then you as an actor have to try and imagine what the creators would want this character to sound like: and that includes the writer, producers, director, and sometimes even the animator. What do they all envision for this character and I use what they’ve given me to help create a new character. Rotoscopers: Is it hard to be consistent in a voice on a series or do you just kind of nail and have it down? I was just talking to a friend about this because I assumed everyone’s process was the same but I’ve learned that it’s not. For me, once I create a character they live up in my brain and they come out to play when it’s their turn. So I don’t have a hard time tapping into who they are. They literally exist in me. The only time it is a challenge is if there is an audition for a series or if it’s a character you haven’t played in a long time that’s an additional character. When you’re doing a show they have you with the SAG rules do up to 3 different roles, which is why they hire versatile actors. It saves studios money because they don’t have to bring in 3 people. So, sometimes it’s like ‘remember that Sally voice that you did’ and then you need a little refresher course for your more obscure characters. Rotoscopers: When you did Raven for the 2 different series (Teen Titans and Teen Titans Go!) was that hard to transition from a serious series into a comedic series? Not really because she’s pretty much the same, nothing gets her going. Thankfully Warner Brothers kept the group together. I think that was a huge asset to the show and why it still worked. The initial audition for Raven was one of those really organic moments where I was already playing 5 or 6 tragic teenagers and I had to figure out a way to make her unique. I went in and I did my own voice, which was similar to Batgirl. I was leaving the studio, and I said to the director ‘do you mind if I try something else as I just had this idea?” and she said “hop in” and that’s where this weird guttural voice came in with everything she says. It’s really the same character on both. She still hates everybody. She doesn’t get too excited about anything. The most challenging part about Raven is if she has to yell or do something high action because that’s not where she normally lives. 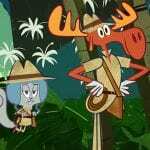 Rotoscopers: Is it especially hard on a project like The Adventures of Rocky and Bullwinkle to voice such an iconic character? Well, it’s certainly always daunting to step into some shoes that were already very fabulous and appreciated by people worldwide. And June (Foray) is one of those women who was a trailblazer and iconic and everybody loved and knew her voice. So whenever you step into a role like that as an actor, or I do anyway, you want to make sure to honor how she created this character, as well as give it my own flair and identify with the audience. It was very hard but also at the beginning they didn’t want an exact voice-match. 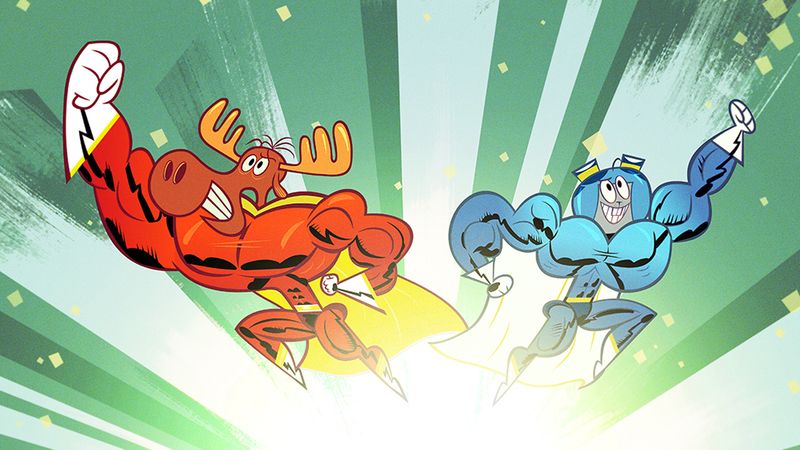 They wanted Rocky to be a little bit deeper, a little bit more sarcastic but sort of based in June’s vision, but the Bullwinkle was exactly Bullwinkle. There was always this weird tug at the beginning, and I swear when she passed it was almost like she jumped in my body and said ‘OK this is how Rocky talks”, and she kind of took over. It became more authentically Rocky. I asked the director if I could go back and fix the first 3 or 4 episodes we’d already recorded because this felt more in the pocket. This felt like Rocket J Squirrel to me and he did indulge me in that. I’m sure June had a hand in that. 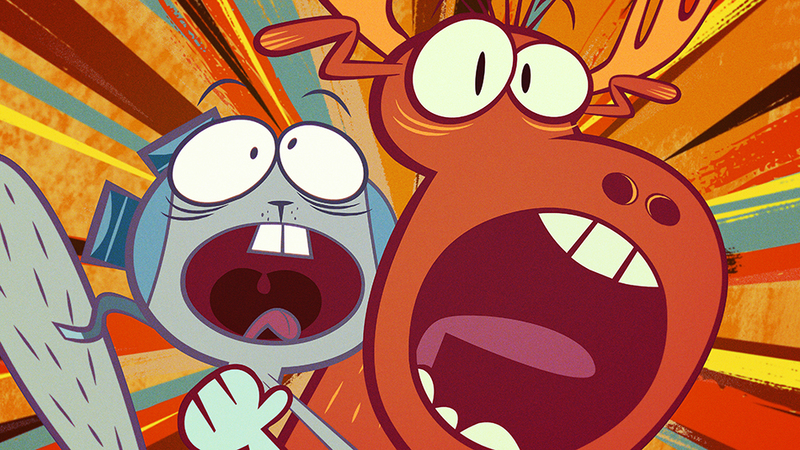 Rotoscopers: What do you think makes Rocky and Bullwinkle so timeless? I think that the older generation that view it growing up, even in reruns, that takes you back to your childhood and watching it as a kid. There’s a nostalgic element to it and it was always very clever and witty, tongue and cheek. The characters were well fleshed out and different and all had these amazing relationships and that spoke to that generation. I think politically we are in a funky time where those sorts of digs and jokes are relevant once again. These characters have such depth to them that even though they are silly and can be stupid there’s so much relatability. It still speaks to all ages. There’s nothing that a child can’t watch but there’s enough adult humor that the parents can enjoy it. It’s sort of one of those things that transcends generations. Rotoscopers: It’s a very energetic show. Is it hard sometimes get that energy when you are doing the vocal performance? Well, when we go full cast recording, not really because we all feed off of each other. I initially was not cast as Rocky, and so when I stepped in I had to catch up on what they had already recorded. So I would do like 5 episodes in a row by myself and that would be vocally taxing. If we do one or two episodes together in the group it’s easy to get the energy up for that especially with being how fabulous that room is it’s not really challenging. It’s more of just a fun ride that we all get to go on. Rotoscopers: So you guys group record then for this show? Rotoscopers: Oh interesting. That’s pretty rare right? Not really. 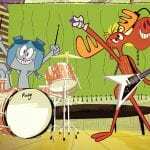 Animated series try to do that as much as possible because it’s so much better if the performers can play off the other actors. Even if you think you know a character really well another actor may do something unexpected and you get to respond to that. You definitely feed off each other energetically. When you do the feature film you are alone. When you do the video game you are alone but animated series is one of the few in voice-over where you get to play and feed off the other actors. Rotoscopers: Interesting. I didn’t realize that. I thought it was pretty rare to get the group record. Oh yeah. That’s part of the reason why Teen Titans works is because we are all there together. We feed off of each other and are just having so much fun. Rotoscopers: Cool. I was going to ask is there a big difference in your experience between voice acting for films and a series? Yeah like I said when you do the film you are by yourself and it’s enjoyable and beautiful, still a very rewarding experience but creatively it’s more fun to be with other actors. Unless you have a small role and then you’re just sitting there while everyone else is having all the fun! It’s just a different environment when you are doing feature work. Rotoscopers: You’ve had to sing in various roles. Is that intimidating? I love, love, love singing. Most of us are singers. It’s not really intimating. It’s so much fun. The only time it’s intimidating is maybe when I’m with a big music producer, or they didn’t give me the sheet music in time. If you’re kind of learning on the fly you want to do a good job, but for the most part we get really excited when we get to sing. Rotoscopers: Interesting. I feel like it would be a lot harder to keep your voice in character while singing than just talking a voice. Like I said, when you create this character, that’s who they are, so you know how to laugh in that character. You know how to burp in that character. You know how to sing in that character. 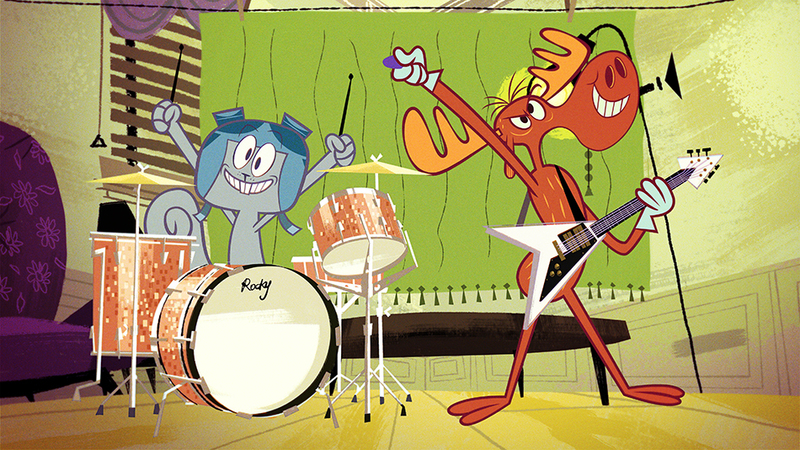 Even in this season, there’s a whole story arc about Rocky and Bullwinkle being in a rock band, and so I know how Rocky thinks. Rocky is not going to sing like Melody from the The Little Mermaid or Bubbles from The Powerpuff Girls. Rocky is going to sing like Rocky. That’s not even a thought in my mind. Occasionally they will have a character step out of how they would instinctively sing like there’s been times on Titans where Raven sings, and they want her to be a pop star. Then you get to break out from that mold, but for the most part, singing in character is as organic as singing in that character. Rotoscopers: So do you have a favorite role that’s especially special for you or are they all equally special? They are all really special and so much fun. 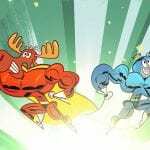 Like I said, Powerpuff Girls and Teen Titans are all collaborative group recordings and now of course Rocky and Bullwinkle we have so much fun. But I always say my favorite role I ever played was Melody from The Little Mermaid 2 because I grew up idolizing Jodie Benson, impersonating her and singing The Little Mermaid songs. So when I first moved to town I got to play her daughter and singing with her in the studio was very surreal. Rotoscopers: That is really cool. The Little Mermaid was very special for me growing up as well. I can’t even imagine what that would be like! Rotoscopers: So what advice would you give to someone who wants to get into voice acting? I always say it’s really important to come from an acting background. You have to take as many classes as you can. Singing lessons, improv classes so that you’re ready when you get the gig, and you know how to tap into the different areas of your psyche and who you are. It’s not just reading off of a piece of paper. Do you know how to break down a scene? Do you know what you’re feeling in these moments? After take all kinds of acting training then if you can get into a class that’s in a studio that’s reputable, that has people that have worked in casting or extensively in the business, then you can take those classes, make a demo and submit it to your agent. The one thing I caution everyone in is you can never pay to audition. There are tons of these organizations that are huge scams that promise success if you pay for auditions. It’s completely absurd. There’s not one person in my world that pays to audition. An agent gets a commission of what you book and it’s negotiated from the network so it’s not something you ever out of pocket have to do. 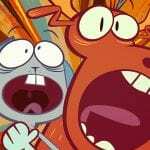 It infuriates me because so many people want to get into this business and would give their left arm to be on an episode of Rocky and Bullwinkle. To prey on hopefuls with this false promises is infuriating. Rotoscopers: That is very frustrating especially when people are so vulnerable. Well, I’m excited for the new season, and I’m sure our readers will be very interested. It’s so funny and season 2 in particular has really found its feet. If you watch any show from the first few episodes to the next season you see a progression and growth of these characters. This season in particular is so funny with so many great guest stars with Weird Al and Mark Hammil, Mario Lopez. It’s so funny. I’m particularly proud of this season and I think people if they give it a chance they will definitely laugh and have a good time. Rotoscopers: Cool! I look forward to watching it. Thanks so much for letting me talk with you and get some insight into your amazing career. We are all really big fans.